The application fee shall be paid in the form of a crossed cheque / cashier order payable to the "Hong Kong Housing Authority" (existing charge is $620). A Certificate of Availability for Sale will be issued to the HOS flat owner after the HD has verified the application. Please click here to check for information on HOS Courts aged between three to five years from first launch. Please click here to check for information on HOS Courts aged exceeding five years from first launch. Sell in the Secondary Market: TPS flat owners, from the third year onwards from the date of first assignment, may sell their flats in the HOS Secondary Market to tenants of rental housing estates managed by the HA or the Housing Society (HS), authorized residents of Interim Housing managed by HA, or holders of Green Form Certificate issued by the HD without payment of a premium to the HA. The completed application form should be submitted to the District Tenancy Management Office concerned together with an application fee and a copy of the Deed of Assignment. The application fee shall be paid in the form of a crossed cheque / cashier order payable to the "Hong Kong Housing Authority" (existing charge is $620). A Certificate of Availability for Sale will be issued to the TPS flat owner after the HD has verified the application. 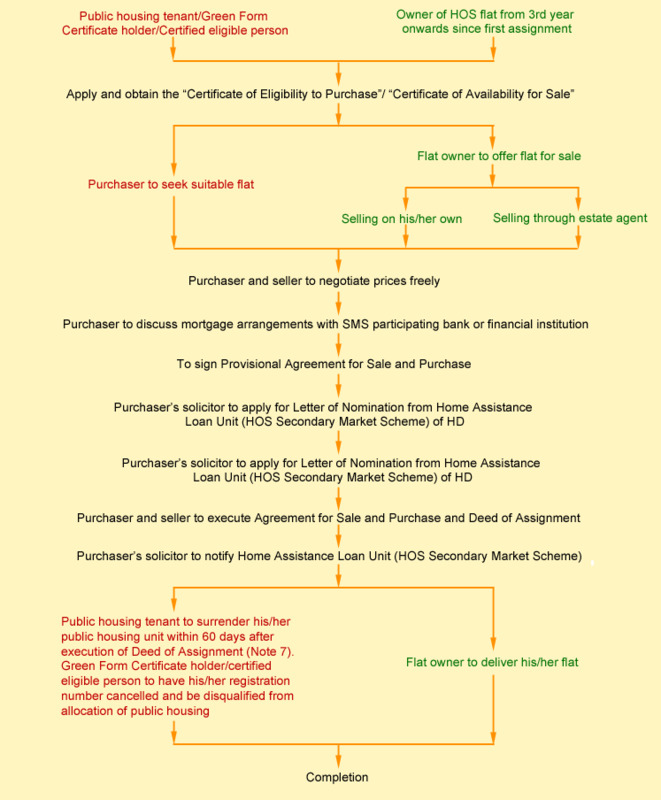 Owners who have sold their flats, and their spouses are not eligible to join any of the subsidized housing scheme administered by the HA (including public rental housing, Home Ownership Scheme (HOS), Private Sector Participation Scheme (PSPS), Home Assistance Loan Scheme (HALS), HOS Secondary Market Scheme, TPS) and any subsidized scheme administered by the HS. Please click here for information on TPS Estates aged between three to five years from first launch. Please click here for information on TPS Estates aged exceeding five years from first launch. HOS flat owners must pay the premium within two months from the date of the Notice of Assessment. Otherwise they have to re-apply and pay administration fee at $3,000 .